Traditional bar codes which I’m sure you’re familiar with use vertical lines and can only hold up to 20 digits, whereas QR codes are two-dimensional (2D) and can hold much more information. Really it makes it EASIER for a customer (or potential customer) to obtain further information about a product – WITHOUT having to enter in information (e.g. your website address). It’s a good marketing and sales tool. I’ve recently seen a big electrical goods retailer use QR codes as a ‘teaser’ for advertised specials. 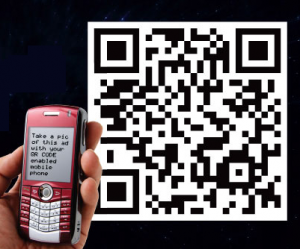 So it will be interesting to keep tabs on the varied (and creative) uses for QR codes in retailing and business.